Prince William and Kate bid farewell to P.E.I. Prince William and Kate departed Prince Edward Island from Summerside Airport Monday evening after a whirlwind tour of Canada's smallest province. Prince William and Kate departed Prince Edward Island from Summerside Airport Monday evening after a whirlwind tour of Canada's smallest province where the prince landed a helicopter in a mock emergency landing and raced his bride in dragon boats. While in Summerside, the royal couple boarded the Canadian Coast Guard Ship Edward Cornwallis to watch an on-water search-and-rescue exercise in Summerside harbour. They greeted dignitaries and officials, then did a walkabout amongst the crowd before heading to the Summerside Airport. At the airport, William and Kate again thrilled crowds with a walkabout. P.E.I. 's Lt.-Gov. Barbara Hagerman and Premier Robert Ghiz were among the officials on hand to bid goodbye to the couple before they departed for Yellowknife. William and Kate spent the bulk of the afternoon at Dalvay-by-the-Sea on the Island's North Shore. William participated in a "water bird" emergency landing exercise aboard a Canadian Forces Sea King helicopter. Kate watched and took pictures of her husband from below. William, who is an RAF search and rescue helicopter pilot, landed the chopper on Dalvay Lake in an exercise that simulates an engine failure. William was excited at the prospect, said the CBC's Heather Hiscox, who spoke with him Sunday night at a reception for journalists covering the royal tour. William told her not to be nervous, she said, if it looks as if things are going wrong, because the water landing is an emergency scenario, and that's what it's supposed to look like. The water-bird procedure was developed by Canadians and the prince will return to his colleagues in Wales to share his co-pilot training experience. Perhaps still flying high from his mock rescue operation, William was victorious over his wife in a dragon boat race on Dalvay Lake. They were joined in the boats by Ghiz and his wife, as well as professional racers and Island athletes. Kate once trained as part of a dragon boat crew in 2007, and the rivalry with William appears to be genuine. During a Sunday night media reception, Kate told the CBC's Heather Hiscox that she and William are so competitive that they can't finish a tennis match against each other. Following the race, the couple attended a beach luncheon featuring provincial culinary and cultural traditions including a lobster boil and clam bake prepared by Holland College's Culinary Institute of Canada. Although royals aren't usually allowed to eat in public, they were caught on camera munching on the local fare. The couple was also entertained by Celtic and Acadian musical groups and participated in a Mi'kmaq smudging — or welcoming — ceremony. Kate and William had a chance to meet the characters Anne and Matthew of the popular Anne of Green Gables: the Musical, the long-running headline play at Charlottetown's Confederation Centre. Kate is rumoured to be a huge fan of the Anne of Green Gables books. William also joined in a volleyball game and Kate admired royal-related sand sculptures by Maurice Bernard. 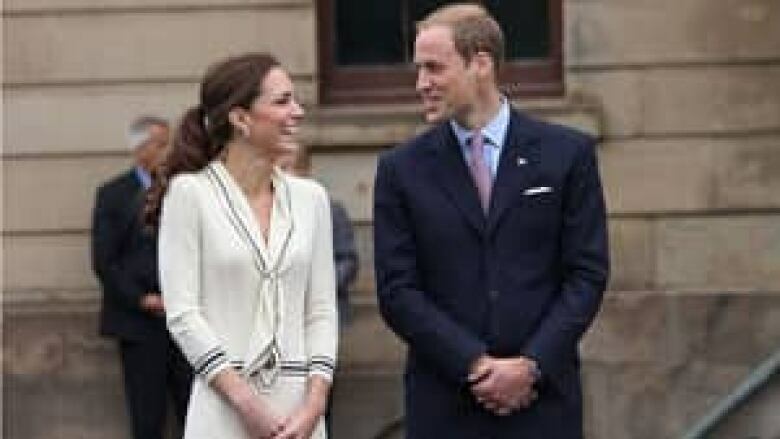 On Monday morning, William thanked the people of Prince Edward Island for their hospitality as he and Kate greeted crowds at Province House in downtown Charlottetown. "We have both so looked forward to this day, and discovering more about your beautiful island," William said after the couple took a quick tour of the historic building, considered the birthplace of Confederation. William's short speech followed welcoming remarks by both Ghiz and Kathleen Casey, Speaker of the P.E.I. legislature. Then the couple, joined by Ghiz and his wife (also named Kate), were taken by horse-drawn royal landau to Confederation Landing on the waterfront, where they watched some musical performances. The royal couple arrived from Quebec late Sunday afternoon at Charlottetown Airport, where they were greeted by a piping band and several hundred people. PHOTOS: William and Kate in P.E.I.